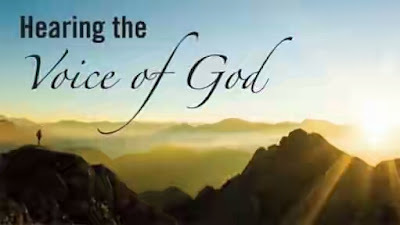 This article discusses why the voice of God can sometimes seem elusive or even nonexistent; and investigates the many sources of voices that speak to us from the spirit realm. Jesus died on the Cross not just to forgive our sins but ultimately to bring us into a relationship with God. Communication is probably the single greatest vehicle of any relationship. Although some people have a problem believing that God wants to talk to everybody, most believers understand that true prayer is not just petitioning Heaven with a list of requests, but is communicating with Him as a true friend. Jesus said, "My sheep hear My voice..." (John 10:27). Prophecy, in its simplest form is merely hearing from the Holy Spirit and repeating what He said. Paul said it this way, "For you can all prophesy one by one..." (1 Cor. 14:31). Moses said, "Would that all the Lord's people were prophets, that the Lord would put His Spirit upon them!" (Num. 11:29). Knowledge is power. God doesn't want the prideful to be the powerful, therefore, God hides His Word so that only the hungry and the humble have access to His voice. God's Word is hidden from the arrogant and the proud. At that very time He rejoiced greatly in the Holy Spirit, and said, "I praise You, O Father, Lord of Heaven and earth, that You have hidden these things from the wise and intelligent and have revealed them to infants. Yes, Father, for this way was well- pleasing in Your sight (Luke 10:21). The parables of Jesus are some of the best examples in Scripture of how the Lord conceals His treasures from the arrogant and proud. Many have been taught that Jesus told parables to demonstrate spiritual principles with natural illustrations. However, Jesus made it clear that He told parables so that people would not understand truth and become powerful. God does not want the prideful to be the powerful. Parables were told not to reveal truth, but to hide it. And the disciples came and said to Him, "Why do You speak to them in parables?" Jesus answered them, "To you it has been granted to know the mysteries of the kingdom of heaven, but to them it has not been granted. For whoever has, to him more shall be given, and he will have an abundance; but whoever does not have, even what he has shall be taken away from him. Therefore I speak to them in parables; because while seeing they do not see, and while hearing they do not hear, nor do they understand" (Matthew 13:10-13). But blessed are your eyes, because they see; and your ears, because they hear (Matthew13:16). Those who are hungry will search out the treasures that God has hidden for them. The Greek word for "hidden" is langanw, which means, "to be ignorant or unaware." When we study the prophets of the Old Testament, we can easily become envious of how clearly they heard God's voice. However, Jesus makes it plain that those who are born again have a tremendous advantage over anyone who lived under the old covenant because God's Spirit now resides within us and is in constant communication with our spirit. It is the glory of God to conceal a matter. But the glory of kings is to search out a matter (Proverbs 25:2). For truly I say to you that many prophets and righteous men desired to see what you see, and did not see it, and to hear what you hear, and did not hear it (Matthew 13:17). God does not want to simply impart information through the gift of prophecy, but rather the goal of all prophetic ministry is to draw us into a deeper relationship with Jesus and His Body. Malachi said that in the last days God would send Elijah the prophet and he will restore the hearts of the fathers to children and the hearts of the children to Father's (see Malachi 4:5-6). Here again we see God's goal for the prophetic ministry deeply rooted in the restoration of relationships. Therefore, if we begin to use the gift of prophecy as a tool to expand our ministry rather than accepting it as an invitation to a deeper relationship with Jesus and His Church, He will "change His language" so that He can tutor us! As He teaches us His new language, He creates an opportunity for us to draw closer to Himself and closer to His people. God's first language is not English. The Lord Is Always Speaking. The Lord is more determined and excited to speak to us than we are to hear from Him. We must realize that God is always speaking but He is not human and His first language is notEnglish! If we can grasp this revelation and realize that most of us don't really know how well we see and hear God, we can begin to "tune our receivers to His station." For example, in the room you are in right now there is music playing all around you. Even if you close your eyes and listen very carefully, you would not hear it. However, by simplyturning on a radio, you would perceive what was there all the time. The reason, of course, is that our human bodies were never designed to perceive radio waves. Likewise, God is always speaking to us! The gift of prophecy is the equipment we need to tap into the spirit realm that exists all around us even though we can't hear it with our naked ear. The gift of prophecy is like a radio receiver from Heaven. It gives us the ability to hear what God has been speaking to us all along but we were unable to perceive before we received this wonderful gift. The king of Israel sent to the place about which the man of God had told him; thus he warned him, so that he guarded himself there, more than once or twice. Now the heart of the king of Aram was enraged over this thing; and he called his servants and said to them, "Will you tell me which of us is for the king of Israel?" One of his servants said, "No, my lord, O king; but Elisha, the prophet who is in Israel, tells the king of Israel the words that you speak in your bedroom." So he said, "Go and see where he is, that I may send and take him" And it was told him, saying, "Behold, he is in Dothan." He sent horses and chariots and a great army there, and they came by night and surrounded the city. Now when the attendant of the man of God had risen early and gone out, behold, an army with horses and chariots was circling the city. And his servant said to him, "Alas, my master! What shall we do?" So he answered, "Do not fear, for those who are with us are more than those who are with them." Then Elisha prayed and said, "O Lord, I pray, open his eyes that he may see." And the Lord opened the servant's eyes and he saw; and behold, the mountain was full of horses and chariots of fire all around Elisha (2 Kings 6:10-17). In Second Kings chapter 6, we see that Elisha's calling as a prophet gave him the ability to hear what King Aram would say in secret to his troops. Elisha became a secret weapon to the king of Israel by revealing the plans of this enemy. Then King Aram decides to capture Elisha.bOn the day of the attack, Elisha's servant comes out of the tent and sees that this enemy army has encircled them. In a panic, his servant runs into the tent and tells Elisha that they are in trouble. Elisha calmly prays for his servant. Immediately, the eyes of his attendant open and he realizes that the mountains are full of horses and chariots of God. This is the kind of prophetic gift that each of us can receive from God. It causes us to be anointed to perceive what is already happening in the spirit world. Without this prophetic gift, we are like blind people in the Kingdom of God! Sometimes we struggle to hear the voice of God because there is a war to keep us spiritually deaf. In the parable of the sower, Jesus explains why often when God speaks to us, the enemy comes along and tries to convince us that we didn't hear God clearly or that it wasn't God's voice at all! Satan's objective is to prevent us from bringing God's comfort and encouragement to one another through the prophetic word. If he can convince us not to speak the word of the Lord by making us feel foolish, or convince us that it was just our imagination and not a prophetic word, then he has succeeded in stealing the fruit of God's word in someone's life! The sower sows the Word. These are the ones who are beside the road where the Word is sown; and when they hear, immediately Satan comes and takes away the Word which has been sown in them (Mark 4:14-15). This principle is also true when it comes to receiving a prophetic word. If the enemy can persuade us that the word spoken to us wasn't really God, then we are robbed of the benefit! The value we place on the word will determine the power we will receive from it.